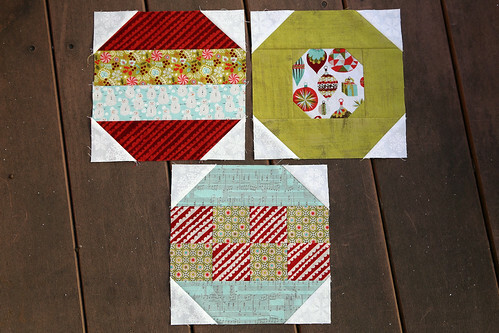 I picked up some Christmas fabric for my birthday last year with the intention of turning it into two Christmas quilts. Predictably, neither quilt was finished by the time Christmas rolled around and I set them aside, patted myself on the back for my "head start" on next year and moved on to the next big thing. 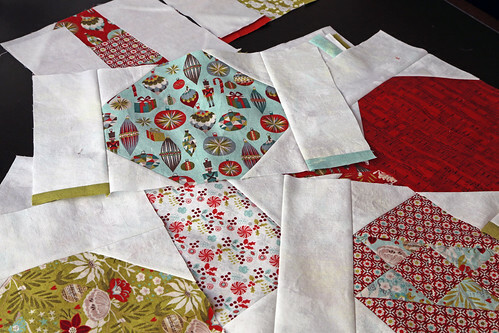 Figuring that I had already started making blocks, I didn't bother digging out the Christmas quilts until mid-October. When I finally did, I was surprised to find that I had actually only made one of the 48 blocks I needed to finish both quilts. Never one to be deterred by great obstacles, I set about making blocks for the quilt I wanted to keep so that I could finish it early and have some time to enjoy it in the time leading up to the Christmas season. There would still be loads of time to make a second quilt for my mom after I was snuggled under a quilt of my own. Two weeks and two blocks on (bringing the score to 3 of 48 for those keeping track), my computational error became evident and I reconsidered my approach, opting to abandon my quilt completely and put all of my sewing time into the quilt for my mom. Fast forward another couple of weeks and I can honestly say that my house is just two fistfuls of tinsel away from looking like the aftermath of a particularly festive Christmas morning except with piles of fabric occupying the places traditionally reserved for piles of discarded wrapping paper. Christmas fabric and half finished blocks cover every surface of our living space and a "don't lean back" rule was implemented for the couch and all four dining room chairs sometime last week to protect the finished bits draped over the chair backs. Despite these efforts, I am still 9 blocks away from finishing the first quilt. 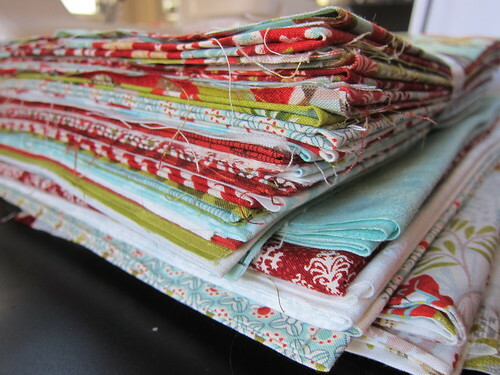 Sounds manageable until you realize that once those are done they will need to be assembled into a quilt top. Borders will have to be added. A quilt back will have to be made and I'll have to bribe someone with a long-arm to quilt the darn thing before I head home for the holidays. There is a high probability that the "finished" quilt will be gifted without a binding attached. I did manage to finish the first two rows of blocks last weekend. It's a small victory but enough to convince me that with some luck and a whole lot of caffeine, I might just get it (mostly) done in time. How are you holiday craft plans coming? 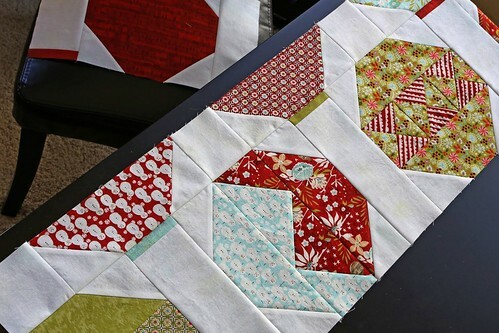 Linking up to WIP Wednesday over at Freshly Pieced. What neat fabrics you choose! I can't wait to see the finished quilt! What is the name of the pattern you used? Hilarious Amanda! Good luck getting it finished, it looks wonderful! 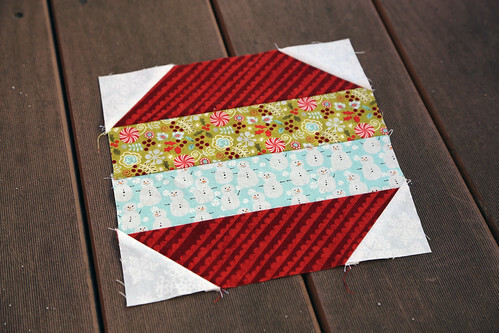 I have a Christmas quilt top from last year, I've had all year to quilt it and I haven't started yet, oops! This sounds very familiar...one year I decided to make 4 rag blankets. One for each of my kids. I did all the cutting for all four and then started sewing. I knew I was never going to get all finished. But I continued working on all of them. Little bit on each one so that none got further ahead than another...Christmas morning each of my kids got a big plastic bag-full of the bits of their blanket- and a piece of paper with their name on it. They were to throw their name in the air and the one that landed closest to my was the first blanket I would finish and so on. They were so happy and excited...not at all worried that it wasn't finished. They had something to look forward to. I'm sure you Mom will be just as happy to be gifted a quilt that needs binding!! Keep up the good work!